Don't skip the lip balm if you want to have soft and smooth lips. 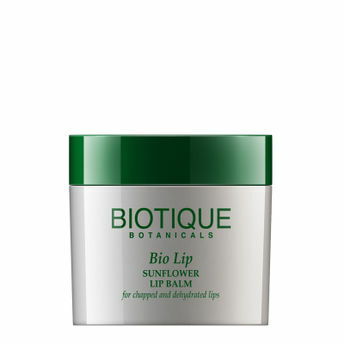 Use Bio Lip Sunflower Lip Balm for beautiful looking lips. Enriched with natural ingredients it makes your lips soft and supple right from the first use. It provides moisture to your lips. Developed to maintain the smoothness of the lips this lip balm does the job impressively. Once applied in the morning your lips stay soft for all day long. This lip balm makes sure that your lips stay hydrated and heal faster. Suitable for chapped and dehydrated lips. Additional Information: Biotique is perfect blend of authentic Ayurveda recipes taken from the ancient and original Veda texts along with advanced cutting edge Swiss biotechnology to give their customers natural Ayurvedic beauty, skin care and hair care products that are 100% organic and safe to use. All Biotique products are made with preservative-free ingredients and no animal testing are done. Explore the entire range of Lip Balm available on Nykaa. Shop more Biotique products here.You can browse through the complete world of Biotique Lip Balm .